Penn Central’s Alco S2 fleet was numbered from 9600 to 9860, and was comprised of units from all three predecessor roads. 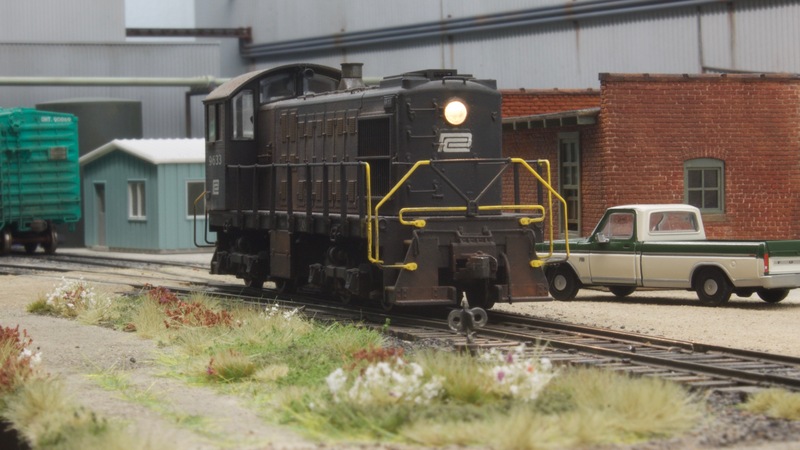 9633 was built for New York Central in 1943 and represents a relatively early example of the model, originally introduced to the Alco catalogue in 1940. 9633 is captured here on its 30th birthday, a blistering hot August afternoon, idling patiently while a five-man crew gets beans in the air-conditioned lunch room at International Paper. I quite like the feeling of depth and space in that first photo. Hunter, just fantastic! A hard worker 9633 she is. LUNCHTIME FOR THE TRAIN CREW—IN FORMER TIMES, IT WAS BEANS!